As you start on a new website project, you will see how important it is to use a WordPress infrastructure thanking to its clear advantages. WordPress is more dynamic, more professional, more functional and is a pool of extensive plugins. However, this is not well enough for a completion of an excellent website project. You need also a theme that will both attract the attention of the audience and that will create a corporate image. Why You Need a Professional Theme? Quality is what all professionals exactly looking for. It might be a good idea to open up worlds with WordPress but doing this with a second-class theme means that all your efforts and work done for nothing because there are many rivals on the planet called Internet and each of them move on in a professional line and say hello to world. Therefore, when you publish either your corporate or personal website project, you should make sure that everything is perfect. That is why, you’re required to have an attractive theme, which has both a professional design and a functional infrastructure. Advantages of Responsive Landing Page Themes are Exactly What You’re Looking For! There is a topic that should never be ignored when talking about stepping into the world of professional internet: we can call it theme trends or theme fashions. 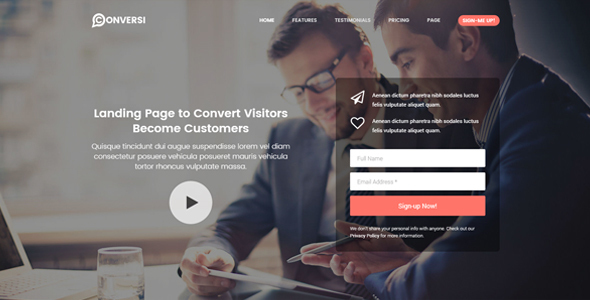 In this sense, landing page type theme designs are among the most preferred themes for new generation internet projects. In particular, there are convincing reasons why corporate content sites prefer the landing page theme model. Firstly, the main message is to be transmitted within a few seconds with the home page. Secondly is that the site has an architecture that convinces visitors to buy services or products. Why Is It Important To Be Responsive? The Responsive landing page theme offers the best resolution from the largest screen to the smallest screen type. In fact, this is an important benefit in terms of SEO because people who visit websites that are not user-friendly will leave the website within a few seconds. As the website’s abandonment rate increases, the value of SEO decreases accordingly. It is easier to keep the user on the site with a Responsive theme. Good Design, SEO friendly, Customizable. A theme with attractive and stylish design is always at the forefront. However, themes like rainbow that are created by more than one color are never the right choice. Professional themes that do not strain eyes, using a number of trendy colors and offering simple elegance can be preferred. A theme must have functional features in order to edit it considering your needs. For that, you need a panel where you can easily control the theme settings. Through the Responsive landing page theme, you can easily control theme settings in one place and create powerful pages with Visual Composer. 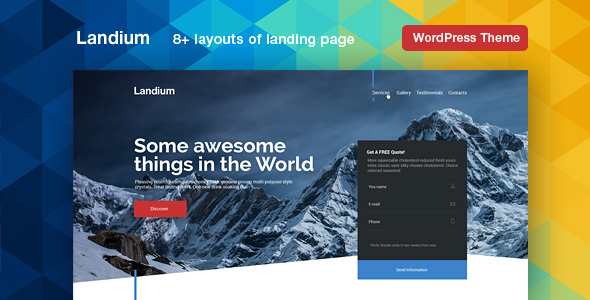 There are 6 different demos available with the Landing Page Theme. You need to make a series of studies in order to be able to claim existance in the Internet world. The most important of these studies is SEO and SEO studies start with a theme to be purchased. If a poorly coded, non-Google-friendly theme is purchased, the expected yield of well planned SEO work may not be taken. Responsive landing page theme with Google-friendly design has a clear and clean coding architecture with HTML5. In addition, high speed performance, mobile compatibility and multi-language support provide an infrastructure suitable for your SEO work. The Responsive landing page theme, which can be used for both corporate and individual website projects increases your prestige in internet, with its flexible, dynamic, simple and stylish features!